Brett Hargrave and Dante Palminteri in Generation Me. Photo by Shira Friedman Photography. Between Netflix hit 13 Reasons Why and Broadway smash Dear Evan Hansen, discussion surrounding the tragedy of teen suicide has become mainstream this year. Joining discussion is the New York Musical Festival’s Generation Me, an emotionally tense and revealing musical that, through flashbacks, tells the story of a teen boy’s death and the ways it affects the lives of his fellow students. In its startling and emotionally rich opening number, the ensemble of teens face the dread of another week at school. Zoe (Brett Hargrave) worries about her boyfriend, while Cody (Will Meyers) stresses about the tense time he’s going through with his best friend. As the song introduces us to the many voices of this high school, it becomes clear that everyone’s facing their own struggles and strains, shouldering their own burdens. Milo Reynolds (Milo Manheim) sings among them, but his problems are a lot more dire, and a lot more pressing. While his friends and classmates sing about their trouble with school, friendships, parents, and relationships, Milo dials a number over and over again, praying that the one on the other end (later revealed to be Cody) will pick up this time. When he’s met with nothing but voicemail, Milo makes his way to his bedroom, and, as his classmates wonder if today has the potential to be the worst day of their lives, Milo takes his own. Milo’s suicide rocks his community, as each of his classmates is forced to confront their guilt over the role they think they played in his death. 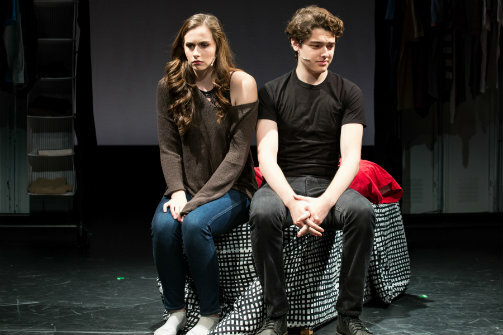 Told largely in flashbacks, the musical revisits key moments in Milo’s life, tackling the substantial social and personal issues that teens face in their high school years. It’s heavy fare for a musical, but director/story writer Ryan Warren, book and lyrics writer Julie Soto, and composer Will Finan turn this into a meaningful story that explores the darker side of the teen experience with honesty. Unraveling on a spare set, brilliantly designed by Starlett Jacobs, the emotions of the story speak for themselves. Casting young actors to portray the story’s haunted teens emphasized the honesty of the show, as it seeks to connect with today’s youth through the stories that affect them in the deepest ways. This is only helped by the cast’s immense talent. Julia Nightingale, who plays Milo’s girlfriend Kaylee, stands out with her incredible vocal talent. At the show’s center, Manheim helps us navigate the intensity of the show’s emotional depth, bringing home the challenges of the teen experience.